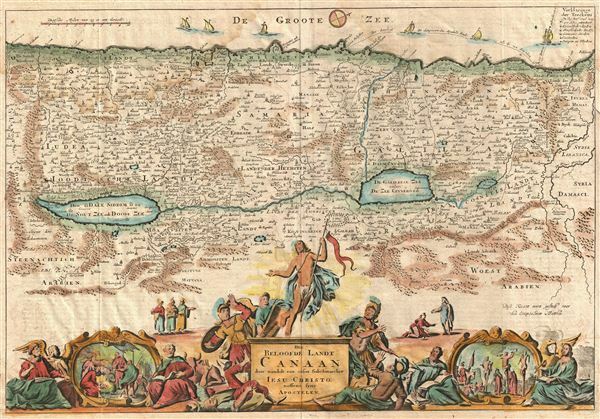 This is a splendid early example of Bastiaan Stoopendaal and Jacob Keur's c. 1730 map of Canaan (Israel or Palestine). Oriented to the west, this map covers the Holy Land from the Mediteranean to just beyond the Jordan River. This map purports to illustrate the Holy Land as it appeared at the time of Jesus Christ; however, numerous elements from earlier periods have been inherited from Stoopendaal's various source maps. These include a fleet of ships in the Mediterranean transporting cedar from Sidon to Jaffa for the construction of Solomon's Temple and, in ruin at the bottom of the Dead Sea, the corrupt cities of Sodom, Gammora, Seboim and Adama.